Gameplay: This point and click game comes in 3 CDs and CD1 is needed in the drive for gameplay and saving. The Main Menu has new game, load, save, settings, credits and exit. Within the game, press ESC to access the main menu. The setting options include video to change resolution and color depth, audio to adjust music, sound and environment and subtitles. Press ESC again will bring back the gameplay screen. There are 'unlimited' save game slots. Press ESC, spacebar on enter skips the cutscenes. Right click of mouse access the inventory bar. Click on an item from inventory and the cursor will change to that item. Right click of mouse will automatically open the inventory and return the item in inventory. At the right end of the inventory bar is the journal. 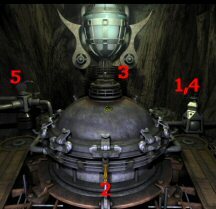 The journal stores information as shown by a shimmering of the journal during gameplay. Note: If the active spot disappears during gaming, exit the game and replay from a saved game. You can die in one world but will be given chances to redo the puzzle. The Keepers have existed forever. They guard the secrets of the universe and are the keepers of the Sacred Rings. They can go to parallel universe and create new realities. 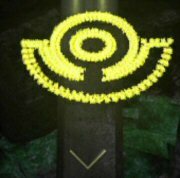 When the Sacred Rings are combined, the holders of these rings supposedly have great power and immortality but are never seen again. You are Umang, the best student of Arakon, the Elder of the Clan of Keepers. You are sent to Ademika to meet Grifit who will continue your training. You are now ready to enter a new reality. Enter the house and go to the book stand at the left side of the room. Read Grifit's note lying on the open book. He wants you to prepare the journey ship that is inside the hidden tunnel for travel. 'Do not forget to activate the navigational map'. When you picked up the note, the journal shimmers indicating information is placed in the journal. Right click and see the inventory bar. Click on the journal at right end and see 5 drawings for this world are entered. To turn the page, place-click the cursor at right side of the page. Turn around, forward and pick up the charger from the bookstand right of the entrance to the next room. It looks like the part that goes on top of the machine in the drawings. Globe - Turn right and see a globe. This looks like the globe in the 4th drawing in the journal. Click on the lamp on the left and then click on the top knob of the globe. When the planets pass under the light of the lamp: the large blue planet turns red; the medium red turns yellow, the ringed green planet turns blue and the small yellow planet turns green. Go to the table at far end of the room by the windows. Look close at scale at the middle of the table and pick up the lighter in front of the scale and the rectangular wood thermometer. Click on the scale to see it move. Back up, turn right, look close and click on green gem to open the box. Automatically get a green gem, red gem, blue gem, a J-shaped stencil, a comma stencil, a V-shaped stencil and a generator. Go to the machine right of the globe and click the lighter at the base of the pot looking machine. This lights the flame to make steam. Then go to the machine right of the steam maker machine. Look close and press the round knob on the square to start a pump. Click on the round knob again to move the steam to the next machine. Go to the machine right of the pump machine and click the thermometer on the rod at right of machine. Slide the knob at center of machine to one line before the end to heat up the steam as shown by the change in color of the purple rod of the thermometer. Go to the machine right of the heat machine and see that it looks like the machine in the drawings. Insert the charger on top and click on the 3 blue tubings on the right to charge the charger. If completely charged, sparks are seen on the charger. Take the charged charger (sic, er... sick). Zodiac Room - Enter the next room and see zodiac signs on the floor and the walls. Climb upstairs and look around on the 3 wall mounts with glyphs that can be rotated. We need more information for this room aside for the items being found in drawings 2 and 3 in the journal. Go down, look right of the entrance and see a pentagonal panel on the wall. Look close and press the 5 metal buttons starting from the top going clockwise. See a contraption rise from the floor. Click on the round dome of the contraption and it opens. Place the generator on the holder. The dome closes. Rods around the base and a wall at right side open. A flame starts on the left of the machine. 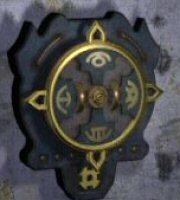 Go to the opened wall, see a door with a black circular lock, turn right and pick up the lever from the left side on the entrance. Note: The puzzles in this room and upstairs need more information. Let's look for more data. Exit the house. Outside the house, pan right and go forward once. Here the path goes forward and a path is seen on the left. Go forward once more and again the path goes forward and another path to the left. Let's go forward to the lit green structure ahead. Planets and colors structure: There are 4 curved columns at the perimeter. At the base of each column is a dome stand. At the base of each stand is a globe similar in size-shape to the planets seen around the house globe. At the center of the structure, there are 4 small stands with 3 colored ovals around it. Planets and colors puzzle - The object of the puzzle is to correlate the dome stands' globes with the planet color seen inside the house. Then correlate the small stands at the center of the structure to the color that the planets inside the house changed to when the lamp is lit. This is explained by the fourth drawing in the journal. 1. Left dome stand shows the smallest planet at the base. The smallest planet shown at the globe inside the house is yellow. Open the dome, and see that yellow is already at the foreground. 2. Next stand shows a midsize planet. The midsize planet inside the house is red. Open the dome and see that the red circle is already at the foreground. 3. The next stand had the ringed planet at the base. The ringed planet in the globe inside the house is green. Open the dome and click on the circles to place the green at the foreground. 4. The last stand has the largest planet. The largest planet inside the house is blue. Open the dome and turn to place the blue circle at the foreground. B: Enter the central area and turn the small stands to have the appropriate colors facing the dome stands. The correct colors are the ones the planets inside the house changed to when the lamp was lit. 1. Turn the leftmost small stand to have the green oval facing the smallest planet dome stand. 2. Turn the next small stand to have the yellow oval face the medium planet dome stand. 3. Turn the next small stand to have the blue oval face the ringed planet dome stand. 4. Turn the rightmost small planet to have the red oval face the largest planet dome stand. Watch the cutscene of lights shooting out and the cover on the floor opening . The navigational map automatically goes in inventory. Exit the structure and take the first side path to the right. Go forward 4xs over the bridge and turn right. Climb up to the bell structure. Bell Structure: There is a pot stand in front of each of 3 pillars. Each pillar has a glyph. Click each pot and see a glyph comes out. Screen captures are shown later. Exit the bell structure and turn right at the main bridge path. Go forward to the end. 3 Pointed Roof Structures: The path splits to 3 stairs each ending at a colored pointed roof structure. To the right of these pointed roof structures is another structure with 3 antennae. At the left is a blue globe. This is explained in the fifth drawing in the journal. Climb each steps, press the blue button on the stand to open the door. 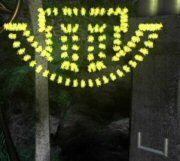 Click twice on each small pink square that is similar to the stencil glyphs taken at the house until a cutscene of lights are activated in the structure with antennae. The comma stencil at the left blue roofed structure produced sparks at the left antenna. The V stencil at the middle red roofed structure produced sparks at the middle antenna. 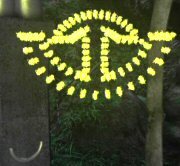 The J stencil at the right green roofed structure produced sparks at the right antenna. See a cutscene of the antennae folding down and opening of a domed roof. Go to the blue globe at the bottom of the steps. Look close, click on the wired top to raise it and take the Zodiac triangle. Go back to the main path via the bridge and turn right on the main path. Go forward once and turn right. Go forward until the split of the path. Green globe structure: Turn right to the green globe structure. Look down and insert the lever on the round knob on the floor. Click to turn the lever. These activates the green globe and in turn the opposite structure. Take the lever from the knob on the floor. Go to the opposite structure. Cardinal points-Zodiac structure: This is explained by the third drawing in the journal. Look down and use the lever on the round knob on the floor. Click the lever to turn it. This activates the cardinal points with zodiac signs puzzle. Place the Zodiac triangle at the center. 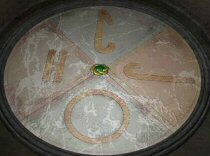 This opens the base of the zodiac stand at the upstairs room in the house. It shows the South part of the stand. Turn the Zodiac triangle to the south and note the Zodiac signs that are pointed at by the Zodiac triangle. Go back to the house since we collected the clues needed. Zodiac Room: Go back to the contraption. Opening the locked door - The clue to this puzzle is seen on the 3 pointed roof puzzle. Based on the color of the pointed roofs - place the blue jewel on the left, the red jewel in the middle and the green on the right. Then insert the stencils on the slots above the jewels: the comma stencil on the left above the blue jewel, the V stencil above the middle red jewel and the J stencil above the right green jewel. Click on the recessed rods on either side to close the machine. See a light shoot out and hit the black circle of the closed door. The black circular lock turns green (red when done incorrectly). Upstairs wall glyphs puzzle - This puzzle is explained by the second drawing in the journal. Note the arrow pointing at the metal under the circle in the drawing in the journal. 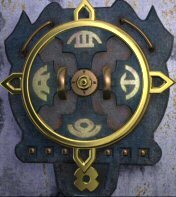 The Glyph clues were shown by the puzzle at the outside Bell structure. Each smoky glyph corresponds to a shape on the pillar behind it. Look close and note the notch of each metal below the circle of each wall glyph. Rotate the circle to place the glyph that corresponds to the notch of the metal below as shown by the Bell structure's smoky glyphs and posts. 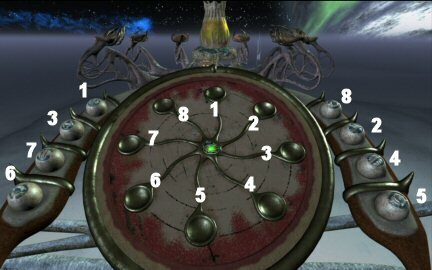 When done correctly, a cutscene of the small dome at the ceiling going down to the central zodiac stand is seen. Zodiac stand puzzle - The clues to this puzzle was seen at the Zodiac structure. Look close at the slot left of the S on the base of the stand. Insert the charger -charged up on the slot. Place the navigational chart on the clip of the dome that lowered down. 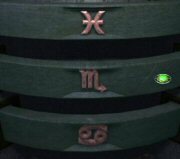 Look close at the Zodiac sign at the base and enter the Zodiac signs pointed at by the Zodiac triangle at the Zodiac structure. Click once on the right side of the zodiac sign of the top ring, once on the left side of the zodiac sign of the middle ring OR click 3xs on the left side of the zodiac sign of the top ring, 3xs on the right side of the zodiac sign of the middle ring. Either way, see a cutscene of the dome closing down and the navigational map will be activated. Take the activated navigational map. Go down the stairs to the door with the now green lock on the opened wall. Enter and go through the tunnel. Belik arrives to inform Umang that there is an uprising within the Clan. Durad and his warriors want the control of the Sacred Rings and the Tetrahedron. Arakon manages to retrieve the Sacred Ring from the keep. He wants Umang to take the Sacred Ring, go to parallel universe, find Grifit and get the Tetrahedron. Just be sure that the Sacred Rings and the Tetrahedron do not fall into Durad's hands. Go forward to the ship. Insert the activated navigational map on the holder. Click the lever on the right side of the deck. Watch the ship fly out of the opening of the dome and arrive at another world. The airship lands on a snowy mountainous place connected by bridges. Exit the ship and walk to the main bridge path. Turn left and enter the door of the tower the airship is attached on. Talk to the man working on a jigsaw puzzle. He says to talk to Armagast and find the tram which will lead to Armagast's office. Exit the tower and go to the end of the bridge and see a control stand on the left. Control stand switch: Not much information yet to do the puzzle. Go back to the man in the tower and talk to him again. The diagram is behind the door. Close the door by clicking on the handle and see red, blue and green icons. 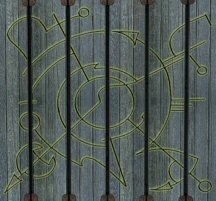 The drawing of the door icons is entered in the journal. Talk to the man again and he asks that if you see pieces of his puzzle to bring it to him. Go back to the switch stand again at the end of the bridge. Bridge Switch panel puzzle - Look close and see 4 round buttons and 4 square buttons. Turning the buttons changes the color of the square buttons. There's a handle at the bottom of the screen. 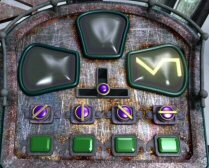 To turn the bridge to the right: Press the round buttons until all the square buttons are green. Click the handle at bottom of the screen and see it get recessed. Press the round buttons in the sequence shown by the drawing / \ │― , from left to right buttons: 1324. If done correctly, see the lines formed. Click on the right pad and the bridge will turn right. Go forward to the top of the mountain. A left bridge goes to a closed building. Go forward to the other side of the mountain to the tram. Sit on the tram and automatically reach the other mountain. Turn left and go down the stairs. Enter the door and talk to Armagast. Grifit is not there but Armagast gives access to Dragast so that Umang can obtain what he seeks (the tetrahedron). The journal shimmers. Look at journal to see 5 new drawings for this world. Go back and ride the tram, climb the steps to the bridge going to the right. In front of the bridge is a large door similar to the fifth new drawing in the journal. Cross the bridge and enter the now accessible building. Temple: Enter and see statues planking the hallway. The statue at the end of the hall is seen at the fourth new drawing in the journal. To the left of the statue is a lever. A drawing on the left wall is similar to the lines of the 5 lined circles at the center of the room. First circle puzzle - The object of the puzzle is to arrange the lines to be similar to the drawing on the left wall. 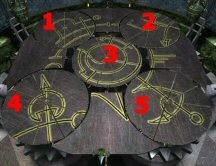 Go to the central 5 lined circle puzzle. Save game here! Note that when the central circle is clicked on, the 4 outside circles rotate. If you click on one outside circle, it becomes inactive and will not turn when the central circle is activated. There are lines in between the circles that can guide you as to which circles need to be turned or not. Go back to a saved game prior to clicking on any circle. If the circles are numbered from top to bottom and going left to right - 1 to 5 (with the central one as 3): Click on 1 3 5 3 3 2 3 1 3. If done correctly see the lever gets activated. Go to the lever and click to pull the handle down. This turns the statue and a manhole on its base is brought to the front. Go down the manhole and forward to the cell door. Cell: The man says he is trapped in the cell and wants Umang to open the door. Cell door puzzle - Studying the puzzle, note that the middle row's metal shape does not conform to the shape of the top and bottom row. The 3 circles on the middle row should be moved to the right end and the 3 triangles on the left end. Here's one solution - Numbering the holes in the middle row from L-R: 1-4 on left end, 5 (middle), 6 (middle bottom), 7-10 on the right end. The directions stated below are from left to right starting from top row. Click on first number to go to the next number. Click on each hole to move one hole at a time. 7 to 4 6 to 7 10 to 9 Press gold button. Meet Arkampus who gives Umang a deal for not telling Armagast about him being there. He shows the key to a secret passage out of the hall. An unknown amulet is in inventory. Second Circle puzzle - Arkampus shows a new pattern on the lined circles on the wall. The central puzzle turns. The solution is exactly similar to the first puzzle. If the circles are numbered from top to bottom and going left to right - 1 to 5 (with the central one as 3): Click on 1 3 5 3 3 2 3 1 3. If done correctly see the lever gets activated. Pull the lever and see the statue turn. Pull the lever again and see the statue lean backwards to have access to the passage above the statue just like the right statue in the fourth new drawing in the journal. Click on ladder and then up to a lit hallway. At the end are 3 mirrors and a desk planking the hallway. Look close at the desk and click on the book on the right to reveal 2 pieces of jigsaw puzzles. Take the puzzle pieces. Go to the other side of the hall and take the left mirror. Climb the ladder at end of the hallway and come out on the rooftop of the temple. See a tumbler pillar with 5 glyphs. Not enough information to do things here. Go back down the ladder, down to the temple, exit the temple, go across the bridge and take the right path to go back to the rotating bridge. Bridge Switch panel: Now, we need to set the switch panel to the blue color and lines ― / │ \ . To turn the bridge to the middle - Press the round buttons until all the square buttons are blue. Click the handle at bottom of the screen and see it get recessed. Press the round buttons in the sequence shown by the drawing ― / │ \ , from left to right buttons: 3412. If done correctly, see the lines formed. Click on the top pad and the bridge will turn to the middle. Go to the tower. Give the man the puzzle pieces. The journal has the drawing of the finished puzzle. Now, those drawing looks like the one on the temple roof top. Let's go back to the temple rooftop. Click on the right lined pad on the switch panel to turn the bridge to the right. Temple Rooftop: Go behind the round tumbler with glyphs and place the mirror to lean on curved metal rods. See the other side of the tumbler. Turn the tumbler so that the glyphs seen on the mirror is the same as the jigsaw puzzle. If done correctly, watch the petal like roof open up, clamps are removed and the lever in the temple goes down. Go back down to the temple and pull the lever. See the statue straighten up. Pull the lever again and see the statue rise up to show a grilled door at the back wall. Go through the grilled door. Climb the ladder to another skyline platform. See an ornate tower on the other side. The bridge spanning here and there is lowered. Go to the contraption on the right. See 4 circles that are reminiscent of the third new drawing in the journal. Raising the Bridge puzzle: Note that the red arrows on the circles have distinct shapes. The top circle of the first panel can not be rotated. The object of the puzzle is to arrange the bottom arrow of top circle to be the mirror copy of the top red arrow of the bottom circle. Note that the last circle on previous panel should be the same as the start of the next panel. After the first set is done, click on the left rim of the wheel on top to turn it clockwise and see the next continuing set of 4 circles. There are 4 sets. If done correctly the bridge rises automatically. Cross the bridge to the ornate tower. Take the Tetrahedron of Dragast. Go back to Armagast via the tram. Show the Tetrahedron to Armagast and he tells Umang to combine the rings with the tetrahedron. To do this, you have to activate the lift. 1. Look around the room and note icons on the floor of the recessed wall across Armagast. Go to the machine left of Armagast's desk. Use the oval button at the center to get the icons seen on the floor. 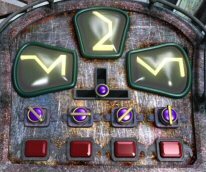 Press the central oval button 2xs. 2. 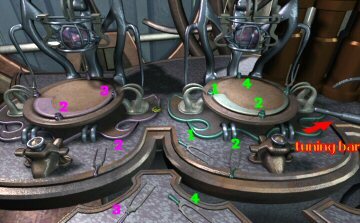 Click on the 4 sets of sliders to show wires with heads similar to the icons in the background. From left to right: click on 4th slider, 2nd slider, 3rd slider and 3rd slider. 3. Go to the slider across Armagast. Pull down the balls to the position shown by the sliders in the other machine. From left to right: 4th position, 2nd position, third position and third position. If done correctly, the lift comes down. Climb on the lift to reach a secret room with more icons on the walls. Nothing to be done here yet. Get on the lift again by clicking the up arrow and reach another floor above. Place the tetrahedron on the center of the stand. See the pillars in the icon room go down. Go down and talk to Armagast. He gives the hint to the icon room. 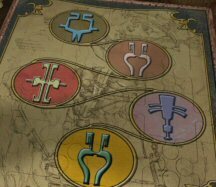 The icons show up on the floor and are recorded in the journal. Memorize, memorize - that was too fast! Go back up to the icon room via the lift. Icon Room: Enter and study the icons. There are 3 columns and each has 3 tiers of icons. Each column has 3 sides, so each tier has 3 icons and one of the 3 not seen. Study the drawing on the journal and compare the icons on the posts. 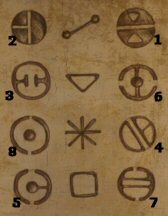 The journal drawing has 3 sets of icons and each set also shows 3 icons for each of the 3 tiers. The object of the puzzle is to arrange the icons on the columns to be similar to the first and last icons in each segment in the drawing. When completed, see energy go across the room and a ball of light enters the Tetrahedron. Go to the lift and ride up. Take the Sphere within the Tetrahedron. Armagast tells you to go to the dungeon entrance at the center of Dragast. There you can combine the Tetrahedron with the Sacred Rings; without the rings otherwise the theta shell will not be able to leave Dragast. Leave room and ride the tram. Go to the turning bridge. Bridge Switch panel: Now, we need to set the switch panel to red color and lines ― \ / │. To turn the bridge to the left - Press the round buttons until all the square buttons are red. Click the handle at bottom of the screen and see it get recessed. Press the round buttons in the sequence shown by the drawing ― \ / │, from left to right buttons: 2134. If done correctly, see the lines formed. Click on the left pad and the bridge will turn to the left. Go forward and enter the building. Go forward until a round metal door bypassing the path to the left. Pass through the metal door and take the path to the right. The left path leads to a lift that is not activated yet. Climb up the ladder and see a round contraption that has pipes leading to the lift down below on the left side. The setup in this cavern is the one depicted in the first new drawing in the journal. 1. Press the button on the right of the contraption. See steam come out. 2. 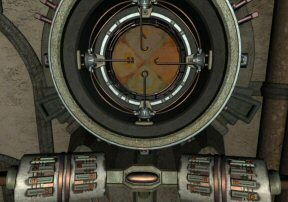 Standing close to the left side of the contraption, pull the lever that is in front. See the clamps rotate and steam come out. 3. Press the top of the contraption and see the small gears rotate. 4. Press the button on the right of the contraption again and see the view change but nothing happens. 5. Click on the lever at left of machine and see it turn to the other pipe. Go down to the lift at the left path. Click on the lever on the floor and the lift goes down. Enter a cave. The waterwheel is depicted in the second new drawing in the journal. Activate the waterwheel: While facing the entrance, follow the pipe coming out left of the entrance. Turn the faucet, pass the 2 tanks, turn the next faucet and then click on the lever on the generator. See the waterwheel in the background start to turn. Go closer to the left and see the other drawn setup at the bottom of the cavern. Go back up via the lift. Exit the cave through the round metal door. Go forward and turn right. Go forward and check the machine setup with a raised platform on the right. It is the setup shown on the fifth new drawing in the journal. Pull the lever on the floor left of the raised platform. This machine setup on the main raised platform is not activated. Go back down. Battery Room: Go forward pass the blacksmith to the end of the tunnel. This is what we saw from above. Go forward to the 3 round battery stands on the left. The left stand does not have a battery. Pull the lever on the ground that is in front of the round battery stands. A mechanic comes out and tells you - not enough contact on the batteries, to go to the blacksmith and get a new one. A broken battery will be in inventory. Go back to the tunnel and give the broken battery to the blacksmith. Take a new battery from the bottom shelf. Go back to the battery stands. Battery stand puzzle - The object of the puzzle is to activate the battery stands by lowering the lid of each stand. The lid lowers down when the exact turn is done on each stand and the battery is in the correct position. The hint for this puzzle is seen on the 3 rows of 3 cylinders in a row at the back wall of this cavern. Study the cylinders and note that they gray cylinders rotates but have a blank circle. The stationary cylinders have red segments on the circle. The position of the stationary cylinder denotes which stand it gives the hint for: the top left cylinder is for the left battery stand, the middle second row cylinder is for the middle battery stand and the bottom right cylinder is for the right battery stand. The circle denotes how many quarter turn the battery stand will make. A complete white shows the battery stand does not turn. So a quarter of red in the circle means that the battery stand turns one quarter, half red means half turn (2 movements) and three fourths red means the battery stand will move 3/4ths of a circle or 3 times. Time to do the battery stands across the room. 1. Place the new battery on the left battery stand under the empty slot of the lid. 2. Check the hint cylinders as to where to position the middle and right batteries so that it will fit the slot on the lid of the battery stand when the turn ends. 1/4 red of clue cylinder means position the battery to be one hole away from the open slot on the lid. 1/2 red of clue cylinder means position the battery to be two holes away from the open slot on the lid. 3/4 red of clue cylinder means position the battery to be three holes away from the open slot on the lid. 3. Pull the lever and see if the correct position of the batteries was done. If correct, the lids close. 4. This is a random puzzle. So if it was not done correctly, a new set of hints are shown on the cylinders in the back wall. If done correctly see that the inactive raised platform passed by earlier is now activated. Go there through the tunnel. Raised Platform: Pull the lever found on the floor at left before the raised platform. The grill rises, go forward to the center of the raised platform. Click on the central hole to raise a handle. Click on the handle and see the opening of the round door at the other mountain by the temple. Click on the lever to lower the little platform. Go to that opened door that is in front of the bridge to go the temple. Exit the building, turn the bridge to the right, climb the ramp and turn right at the middle of the walkway just across the bridge to go to the temple. Joining the Sacred Rings with the Tetrahedron - Enter the opened door. Click on the handle to go down. Turn around and go to the end of the ramp. Look up and place the Tetrahedron on the round bar. Place the Sacred Ring on the lowered pink circular bar. Watch the joining of the Tetrahedron and the Sacred Ring to form Tetrahedron within the Rings. Go to the airship. Click on the lever and fly away to Na-Tiexu. Save Game here! Exit the airship and enter the door of the Mirror house. The house has 4 mirrors in each corner, a backdoor and a table with tuning forks of different colors. The clue for the tuning fork puzzle is behind the table when you first enter the room. When picked up, it will be seen in the journal. Mirrors - See that there are 4 mirrors on each corner of the room. When clicked each mirror produces a series of tones. Under each mirror is a set of 4 bars that made the series of tones. They can vary in length. Above the set of bars is a curve that shows the position of the bars in the series of tones. The tones start at the wide part of the curve as shown by the clue paper. Tuning forks - On the table are 4 circles that have holders for tuning forks. Each circle on the table has that curve that shows the position of the tuning forks in the series of tones produced. The curve and the tuning forks are colored. The curve starts on the left and goes counterclockwise. Based on the clue in the drawing found behind the table, the first tone-tuning fork is on the left, the second on the front, the third on the right and the last at the back of the tuning fork circles. Above each circle is a round crystal that when clicked produces the sound of the set of tuning forks if they are inserted. Note: If the active cursor disappears, exit the game and replay from a saved game. 1. Find which tuning fork circle matches which mirror. Click on the round crystal above the tuning fork holders and match it to the sound a mirror makes. The purple curved circle that is at left end of the table corresponds to the mirror left of the entrance. 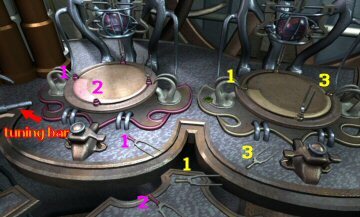 The green curved circle to the right of the purple one on the table corresponds to the mirror left of the back door. The pink curved circle on the right side of the table corresponds to the mirror right of the back door. The gold curved circle on the right side of the table correspond to the mirror right of the entrance. 2. Check the position of the bars under the mirrors and correlate it to the position on the tuning fork holders on the table. This is based on the curve above the bars of the mirror. The only mirror that is similar in position to the tuning fork curve is the mirror on the right of the entrance. This mirror is the one that is matched to the gold tuning fork circle. The rest of the mirrors are opposite in position of the tuning fork circles on the table, so the placement of the tuning fork is reversed. 3. Check the length of the bars under the mirror to see where the low tones to the high tones are positioned. Match the bars to the position of the tuning forks holders on the small circles. 4. Then test the sound of the tuning forks by clicking the tuning fork on the center bar while in close up. 5. Place the appropriate tuning forks on the tuning fork holders. Start with the gold circle, then proceed going to the left. See the correct tuning forks to be placed on the correct slots at the graphics below. Place the numbered tuning fork to the same numbered slot on the circle. 6. Press the button at the center of the table. The mirrors get activated and show the different world. To go to that world, press the button in front of the tuning fork circle. Then go through the back door and enter that world. Astrology World: At the Mirror house, press the button in front of the purple tuning fork circle (leftmost circle on table) and then exit through the back door. Enter a desolate world with a giant moon-planet on the right side and several towers. Go forward and climb the ladder. Talk to the Astrologer. He says that you must first collect all the artifacts of Na-Tiexu before you can find the Tetrahedron of Na-Tiexu. He can help put together the Star Dust but first you must have the Grain of Life found in the Spirit World before you can accomplish anything. Go back to the Mirror house. 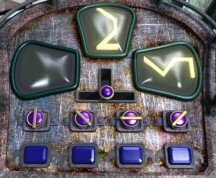 Spirit World: At the Mirror house, press the button in front of the green tuning fork circle (second from the left circle on table) and then exit through the back door. Go forward until you reach an open hut, passing several statues holding a small replica of themselves and side paths with more statues. Climb the ladder and turn left. Talk to the Spirit Woman in black using a mortar and pestle. A Spirit can help you find the Tetrahedron of Na-Tiexu. But first put together the 7 mood figures and come back to her. 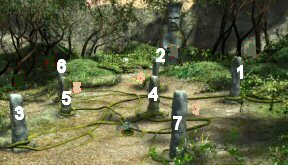 Collect the 7 spirit statues from around the area. Go back to the Spirit Woman and she tells Umang to take the Grail to the Main Spirit. Pick up the Grail from the floor. At the start of the path to the Main Spirit statue that is not holding a small statue, pick up a leaf from the white rocks. Spirit puzzle - Place the grail on the hands of the Angry Main Spirit (with a small pond in front of it). Click on the pond and it will show the sequence of the spirits. Turn around and look at the posts with vines intertwined around them. Follow the start of the vine coming out of the hill on the left while facing the posts. Place the first spirit statue on the first post that is wrapped by the vine. Continue on until the last post right of the post area. If correctly done, the Grail opens and fills up with Spirits. Take the Grail with Spirit. Grain of Life - Go back to Spirit Woman and ask about Grain of Life that the Astrologer mentioned. Talk to her young helper at the other platform. 'There is a tree stump on top of the hill and you will find the grain in its roots. The cave is dark and you need the flower manna to light the way'. Turn around and take the pot with flower manna in a small pot on the lower shelf. Go to the statue accessed by going through a hole on the rocks. Stand in front of it and turn around. Enter the cave. Place the pot of flower manna on the table and see the manna touch the flowers to light the cave. Look up and see a closed flower above the table. Clicking on it does nothing. Go outside, climb the hill to the tree stump and shake-click on the tree by the tree stump. It releases seeds that go through the tree stump. Go down to the cave and pick up the Grain of Life within the shell. Go back to the Mirror house and press the leftmost circle button to get to the Astrology world. Exit through the backdoor. Astrology World: Give the Grain of Life to the Astrologer. The grain needs to be cleaned. Then place it on the 5 dragon stand. When it glows it is ready to be transformed to Star Dust. Clean the grain - Turn around and go to the shelves across the room. Take the vial of liquid on top right shelf. Take the pot with plants at the middle bottom shelf and click on the book to find a clue. The journal has the drawing now. Go to the device right of the Astrologer. Place the grain at the center of the top holed holder. Place the pot of plants on the table. Place the vial of liquid on the top holder on the right. Click on the vial of liquid and watch the grain gets cleaned. Take the Grain of Life without the shell. 5 dragon stand - Go to the table left of the Astrologer and take 2 Dragon statues. Go to the ornate 5 dragon stand. Place the 2 dragons on the empty pedestal. Place the cleaned Grained of Life at the center of the device. Watch the dragons charge the Grain of Life. Pick up the charged Grain of Life. Show the charged Grain of Life to the Astrologer. He says to align the planets upstairs. Climb the spiral staircase. On the wall, see the 4 icons seen in the journal drawing. When pressed, the dumbbell moves once from the start, the square moves 2 spaces away from start, triangle moves 3 spaces away from start and the asterisk is 4 spaces away. Go outside through the door beside the icons on the wall. Look close at the Planet puzzle. Planet puzzle - Place the Charged Grain of Life on the vase at top center of the puzzle. This activates the puzzle. Watch. The object of the puzzle is to properly place the planet balls in the holders. 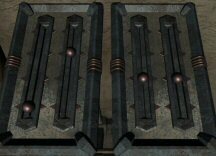 There are 3 balls that are preset to be placed on specific slots. Based on the numbering on the graphic below: Ball 1 can only be placed on slot 1, ball 6 can only be placed on slot 6 and ball 8 can only be placed on slot 8. The clue on the journal shows the matching pairs. The clue on the wall in the next room shows how far apart the matching pairs are from each other. The dumbbell pair is one space apart, the square pair is 2 spaces apart, the triangle pair is 3 spaces apart and the asterisk pair are 4 spaces apart. Dumbbell pair: Preset placed ball 1 is one space away from its matching ball 2 at slot 2. Triangle pair: Preset placed ball 6 is three spaces away from its matching ball 3 at slot 3. Asterisk pair: Preset placed ball 8 is four spaces away from its matching ball 4 at slot 4. Square pair: Ball 7 and 5 is 2 spaces away from each other. Placement was trial and error. Click on the central button and watch. Take the Star Dust. Go back to the Mirror house. Children's World: At the Mirror house, press the button on the rightmost gold circle and exit through the back door. Children: Go forward and enter the door on the left. See some children's drawing on the wall. Note the drawing left of the closed door. It has a pinwheel of pink, green, red, blue and yellow colors. Take the magical pyramid from the table on the left. See a baby's bed. Take glowing fang - yellow from one of the gold trays right side of the room. Exit the house and continue our travels. While strolling down the path, take the glowing fang - pink from the pink lamp on the left, glowing fang - green from the green lamp on the right, glowing fang - red from the red lamp on the left and glowing fang - blue from the blue lamp on the right. Look close at the stand at the end of the path with shimmering light above it. Fang puzzle - Based on the children's drawing inside the house place the glowing fangs - starting from one o'clock position: pink, green, red, blue and yellow fangs. Double check the placement of pink and red fangs. If correctly placed, see the shimmer enter the cave. Enter the cave, go forward twice, pan left and forward. Pick up the teddy bear. Go back to the children's house. Place the teddy bear on the empty baby's bed. Exit the house and then go back in. Talk to the blond girl. Follow the girl through the door. Take the left path and reach the water's edge. Look around and see a hovering bird. Talk to the children. The boy wants you to ask the bird to sing. Go to the bell and ring the chimes to hear it. Crystals: Go back through the tunnel passing the way to the children's house and forward until the green pool. The path goes left to a bed of crystals and to the right to go around the pool. Go left to the crystals and place the magical pyramid on the indentation on the rock just below the crystals. Take-click on crystal left of the pyramid. Take the magical pyramid again. Take the right way from the main path, look down and see green sludge flow like waterfall. Place the magical pyramid to block the flow and see the green sludge rise close to 3 crystals across the pool. This act also lowered the green pool and a bridge is now seen. Go back and cross the bridge. Go close to the 3 crystals and see pink stalactites above it. Turn right, forward and take the magical pyramid that blocked the flow of the green sludge. This lowers the green sludge from the crystals. Go back to the crystals and see a small platform. Pan left from here and go forward-down to 2 pumpkin-like things that plank a crystal. Place the crystal in inventory on the crystal between the pumpkins. See the plant below revive. Take magical branch from the plant. Go back to the crystals under pink stalactites. Place magical branch on the platform. Place the magical pyramid on the green waterfall to dam it again. Watch the stalactites drop something on the magical branch covered by green sludge. Take the magical pyramid again. Go back to the crystals and pick up the magical dust from the platform. Dam the green flow with the magical pyramid again and cross the bridge. The magical pyramid cannot be taken anymore. Go back to the children by the water's edge. Across from the children is a bed of blue plants. Place the magical dust on the plant. The plant grows and throws dust to the sky. The bell starts to chime and supposedly the bird should start to sing (I didn't hear it). Go to the bell and click on it. It will now be in inventory. Go back to the Mirror house and go to the last world. Magical World: At the Mirror house, press the button on the second (pink) from the rightmost circle and exit through the back door. Go forward and take the left path (the right path gets you killed by warriors). This path has a cave on the left, stone platform on the left and a dried plant blocking the way at the end of the path. Note that there is a leaf on the left on the ground by a big rock. This is a clue. Go back and enter the cave on the left. Go forward until the way is blocked by vines. Pan left and pick up the stick. Go out of the cave. Continue on the left until a stone platform. See that the 3 middle stones on the post are active. Use the stick on the stones. The platform falls down allowing light to enter the cave and the vines blocking inside the cave disappears. Go back to the cave and now the path is cleared. Go forward until the waterfall which blocks the way. Click the leaf taken from the spirit world on the waterfall to get leaf with water. Go back outside to the dried plant blocking the end of the main path. Use the leaf with water on the dried plant. It revives to make a way to the top. Climb up. Turn left and see a log. Click on the stone holding the log on the left. See a cutscene of the log tilting and possibly diverting the water flow. Teleportation-Gong Courtyard: Go back to the cave and at the end, the waterfall is not there. Go through and out to a courtyard with intricate posts and a gong. Each post has a red holder at the base. DO NOT HIT THE GONG - OR YOU DIE! Beside the gong is a set of drums 4 each of 4 colors - blue, green, yellow and red. Click on them to hear the sound they make. Warriors teleported - In front of the gong is a stand with gems at the base. Take the blue, green, red and yellow teleportation crystals. Place the crystals on the red holders at the base of each post. They will get clamped only on the posts that need it - blue, red, green and yellow. Click the button on the teleportation stand and see a teleportation bubble form. Hmm... Maybe we can get those pesky warriors get transported somewhere else. Hit the gong, turn around and immediately press the button on the transportation stand - The warriors should still be on the other path and have not reached the courtyard. I wonder where they went to. Drum-crystal puzzle - Go forward and see a giant crystal with 4 sides. Each side has 4 circles. Click on each circle and hear a sound. Look down and see a color at the base. Do this to all the sides. Each side has the same sound but different colors. Where did we hear that clunk sound? Go back to the drums. Click on each color and note which drums have the same clunk sound as the circles on the giant crystal. Go back to the crystal. Highlight (gray circle) or click only on the position shown by the drums that has the clunk sound. To change the color of the highlighted back to white (unselected) - click on it again. If done correctly, the crystal disappears to make the Symbol of the Magical World. Go back to the Mirror house. See that each mirror is now activated. Go back out through the backdoor. Assembling the Sacred Artifacts and the Sacred Rings-Tetrahedron: Enter a chamber with 4 mirrors on the wall and a central one at the end of the chamber. At the center are 4 holders. Place the different Sacred Symbols taken from the different worlds in specific order based on the placement of the mirrors in the Mirror House with your back to the entrance. Facing the stairs on the opposite side, with back to the exit door - Place Bell on the left and Star Dust on the right. With the stairs on your back and facing the exit door - Place Magical world symbol on the left and Grail on the right. Watch. With your back to the steps take the newly formed Sphere within the Tetrahedron. Climb the steps and place the Tetrahedron within the Rings on the stand to be combined with the sphere with tetrahedron forming Assembled Rings. Go back to the Mirror house and exit to go to the airship. Pull the lever and fly to our final destination. Go forward, turn left and open the dome. Click on the shimmering light and the bridge comes up. Go forward and finally meet Grifit. 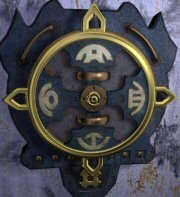 Grifit tells you to go through the latest gate found by the Clan Leaders. This will prevent Durad from getting hold of the Combined Sacred Rings and Tetrahedron of Dragast and Na-Tiexu. Watch Durad and Arkampus. Oh No! They followed the travels of Umang through the unknown Amulet in inventory! Watch the arrival of Durad and the departure of Umang.